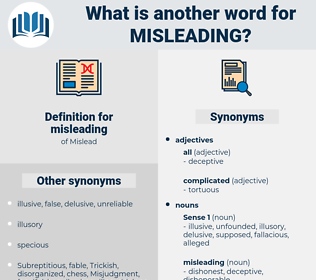 What is another word for misleading? mislead, deceitful, fallacious, specious, delusive, deceptive. misunderstanding, tendentious, illusory, delusional, ambiguous, mendacious, spurious, Misconceived, flawed, untrue, confounding, inappropriate, misinformed, distorted, bogus, faulty, disappointing, unrealistic, denatured, fake, rogue, improper, irresponsible, deceit, wrongful, error, inexact, wrong-headed, invalid, unclear. Deluding, Obfuscating, Fooling, inducing, mixing, Establishing, lying, causing, Generating, cheating, Introducing, Blurring, Kidding, confounding, deception. misguided, confusing, erroneous, fraudulent, mistaken, inaccurate, wrong, equivocal, incorrect, untruthful, dishonest, confused, unfair. right, honest, correct, frank, truthful, straight, accurate, sincere. free-spoken, candid, open, outspoken, trustworthy, elucidative, aboveboard, explanatory, revealing, clarifying, honorable, openhearted, illuminating, revelatory, plainspoken. This whole contrast, however, is unjust and misleading. And perhaps he was punished justly for language so misleading, by the general indignation of the people all around us, not at his failure, but at himself, for that which he could in no wise prevent.